There are two ways to edit your photos. If you use a regular image-editor like Photoshop you need to know the effect you want to achieve and then work out how (the heck) to achieve it. But Tonality Pro, like MacPhun's other Mac-only photo-editing apps, does it differently. It gives you dozens of possible treatments for your images that you might never have thought of, applies them with a single click and has a simple slider for reducing the strength of the effect. If you want more control than that, Tonality Pro has an adjustment panel with a huge array of controls. Each effect is made up of a series of individual adjustments to Color Temperature, Tone, Clarity & Structure, Tone Curve, Split Toning and more. More complex effects can be created by 'stacking' adjustments using Tonality Pro's in-built Layers. By selecting a preset effect and then examining the adjustments it applies, you can 'reverse-engineer' the effects and create your own. Layers in Tonality Pro can be given 'masks' to control their effect, and the new luminosity mask option creates one based on the brightness values in the original image. You can use this to increase (or reduce) the power of the effect in brighter and darker parts of the picture. It's now possible to open your Apple Photos library from within Tonality Pro, choose an image for editing and then share it back to your Photos library. Unlike iPhoto, Photos doesn't directly support external image editors, so this is a handy workaround. 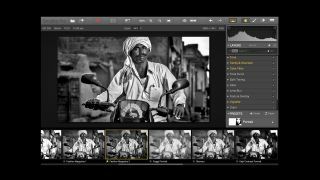 Tonality Pro is a black and white photography tool that works as a standalone app in standard form and as a Photoshop/Lightroom/Aperture plug-in with extra features in its Pro version. There are seven new preset effects and MacPhun has added Force Touch control for adjusting the brush size on new Macbooks. The Pro version adds support for Lightroom CC – you can even send raw files from Lightroom to Tonality Pro to preserve maximum quality, rather than just sending a Lightroom raw conversion as a TIFF file. Tonality standard edition works solely as a standalone program. It's available from the Mac App Store for an introductory price of £9.99/US$12.99. Tonality Pro, however, can work both as a standalone program and as a plug-in for Lightroom, Photoshop and Aperture (nice to know third-party suppliers are still supporting it, even if Apple isn't!). The Pro version adds layers, 'zone system' contrast control, a histogram and sundry other enhancements. The Pro version costs £49.99/US$59.99 from the MacPhun website, and you can also upgrade from the standard version.